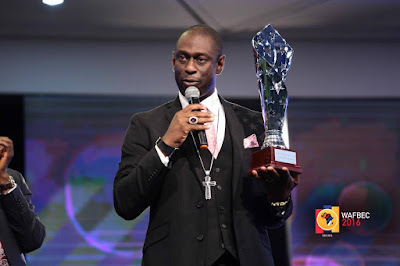 It was a wonderful night yesterday at the ongoing West Africa Faith Believers Convention when Covenant Christian Centre presented a posthumous award to late Archbishop Benson Idahosa. His son, Bishop F.E.B (Faith Emmanuel Benson) Idahosa President, Benson Idahosa University, Nigeria was present to receive the award. Before the award, the church showed a seven minute video of the late archbishop's exploits while he was alive. 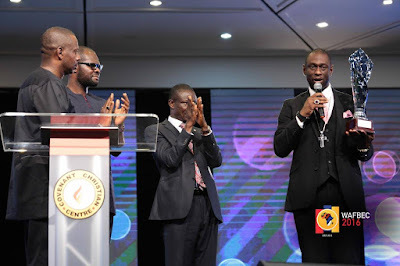 Pastor Poju Oyemade, Senior Pastor of Covenant Christian Centre, recounted how he met the Archbishop. He said that he was humbled by how he was treated when he went to Benin to ask the Archbishop to come for a Believers Convention. 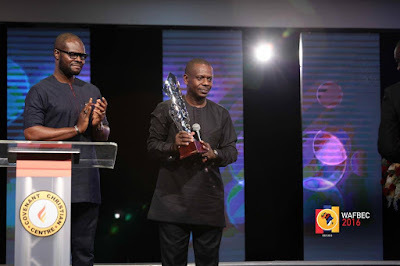 He said he was glad that as a student of the University of Lagos and the President of his fellowship, the Archbishop honoured his request without any hassles. Bishop Francis Wale Oke was also present to tell his own story of his encounter with the Archbishop. Thereafter Bishop FEB Idahosa received the award thanking the church for the award.